Simple, delicious, natural. This is my definition for a good yogurt. If to this we add a special ingredient, like a dried fruit, then you make a remarkable dessert. Boil the milk and let it cool until reaches 45ºC. Add yogurt, syrup and stir until homogenized. Put the tablespoon of dried raisins in each jar. 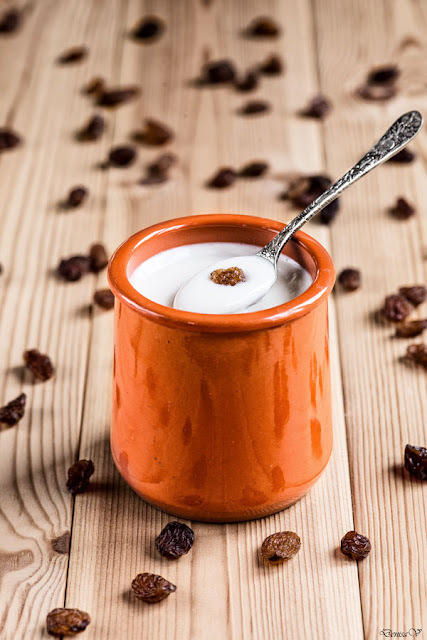 Pour the milk mixture in jars over the dried raisins. Cover the jars with plastic foil and secure them with rubber band. Put the jars in the oven on a baking stone and heat the oven at the lowest temperature (50ºC) for 1h30. In the morning, place yogurt jars in the fridge for at least 4 hours. It can be kept in the fridge up to 2/3 weeks if not eaten before.